West Ridge Road, Rochester - plant security is pretty tight so any activity has to be viewed through barbed wire fencing unless you're a Kodak employee with access to Kodak Park. 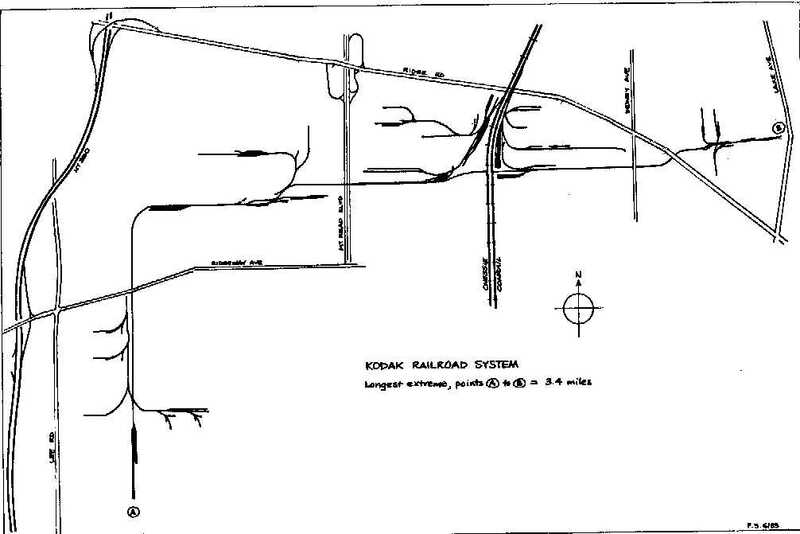 Kodak maintains its own 3.4 mile railroad (19 miles of total track) for interplant delivery of inbound raw materials, plastics, wood pulp, chemicals and coal at it's main manufacturing facility, Kodak Park. The railroad's physical plant includes over 100 switches with point protection, and rail that varies between 80 and 136 lbs. There are 5 yards placed throughout the plant. Read more about the KPRR in this article from the Kodak employee newsletter - The Kodakery - click here. Kodak enjoys the benefit of rail competition because it is served both by CSX and the shortline Rochester & Southern Railroad. The R&S also gives Kodak access to the Canadian Pacific which maintains trackage rights on the NS Southern Tier LIne. Kodak now has access to three Class 1 railroads: CSX, NS via the R&S, and CP via the R&S. 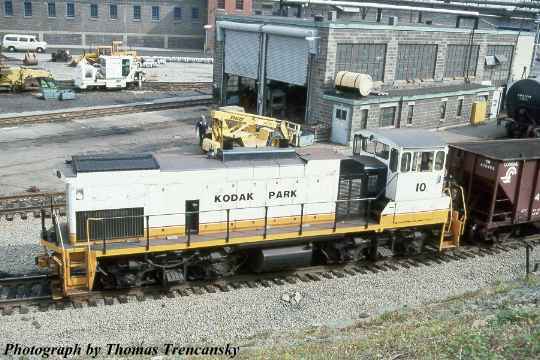 Kodak maintains two EMD switching locomotives (an MP15AC and 2 SW1500's), and leases an engine or two from GWI from time to time. The KPRR interchanges with CSX and the R&S at its yards just south of NY 104 (Ridge Road West) in the city of Rochester. Until 1955, Kodak relied on fireless boilers for locomotives, aka thermos bottles because of their shape. These resembled steam locomotives, but they were not fired by coal or oil. They were used because of the flammable manufacturing processes before the days of safety film. These engines would be partially filled with water and charged with 125 psi of steam from Kodak's vast high pressure steam distribution network. A single charge of steam allowed for several hours of work. Part of Kodak's rolling stock includes 2 special cars designed to haul 18' in diameter wheels used for coating photographic paper with emulsion. This cars allow these wheels to be transported under bridges and overhead obstructions on the property. One of these wheels is displayed at an entrance to Kodak Park on Ridge Road West just east of the Conrail / R&S tracks. 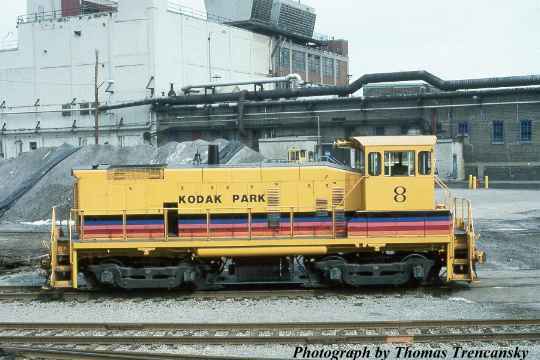 A typical Kodak Park RR day involves moving more 60 cars throughout the plant, which includes more than 2,000 tons of coal for the plant's 2 steam and electricity generating plants. The KPRR is located within the confines of Kodak Park. Access from outside the plant is next to impossible unless you're a Kodak employee. Kodak Park is surrounded by barbed wire fence and is patrolled 24/7 by Kodak Security. There are parts of the KPRR viewable from public places... but getting good pictures can be difficult. The railroad has changed within three different departments within the last 12 years, and they have entertained third party intrestest from time to time to operate the railroad. Several of the employees now working at Kodak Railroad were once CSX or B&O/R&S employees. The KPRR is an insolator railroad - not having to conform with US DOT FRA safety rules and regulations. 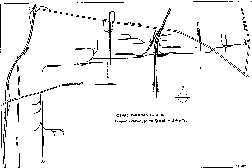 HISTORY: Rail spur to the NYC Charlotte Branch was built in 1907. Connection to the B&O's Rochester Belt Line was built in 1929. KPRR expanded past Mt. Read Blvd in 1947. Expansion in 1969 allowed to KPRR to access Kodak's Central Distribution facility on Lexington Avenue. First locomotive purchased in 1918 (horses were used previously) - a fireless boiler. KPRR entered the deisel age in 1946 with the purchase of a an 80-ton GE center cab, which was donated to the Rochester Chapter NRHS in Industry and is still operational. CREDITS: Trains magazine by Michael M. Byrne, July 1988.